It’s been 12 years since Mr Caldicot sat down our Year 10 drama class and told us America had been attacked. I remember Rebecca getting upset – her father was traveling in the States that day – but the rest of us sat in a numb, confused silence. The sheer scale and enormous heartbreak surrounding far away buildings that many of us hadn’t even heard of was hard to comprehend. Twelve years on and being here makes it even tougher to understand. Every time I walk near the World Trade Center I think of the people who fell there, but I will never be able to imagine the extent of the chaos and pain that day, in this unshakable city. 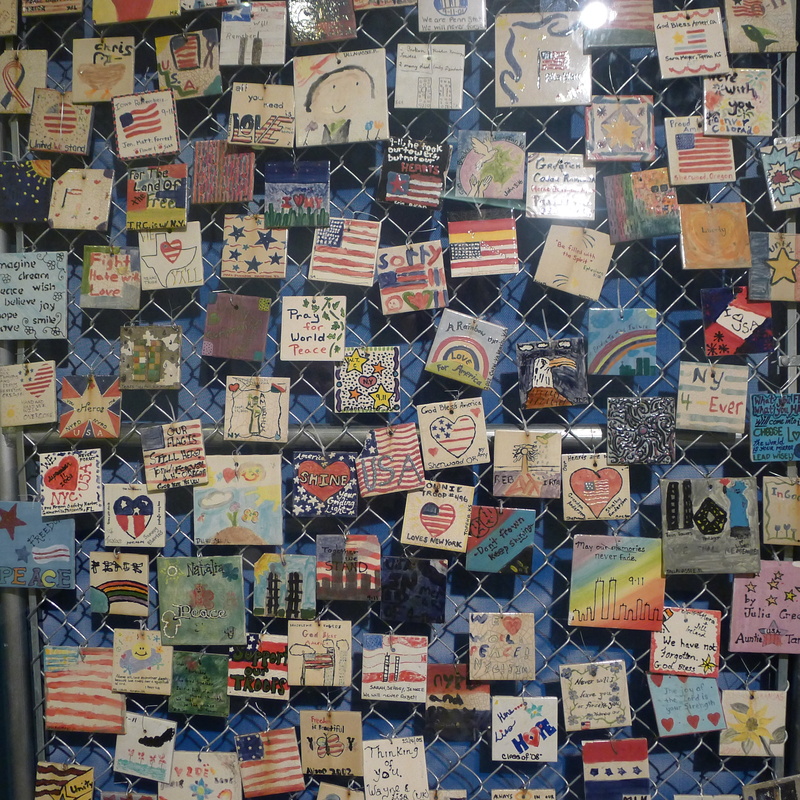 When it came to today’s new activity, I knew I wanted to stop for a moment to think about the nearly 3,000 victims. But I’ve been to the 9/11 memorial before and I’ve seen the Tribute in Lights – two beams of light reaching to the sky where the towers once stood – so wanted to go somewhere else. 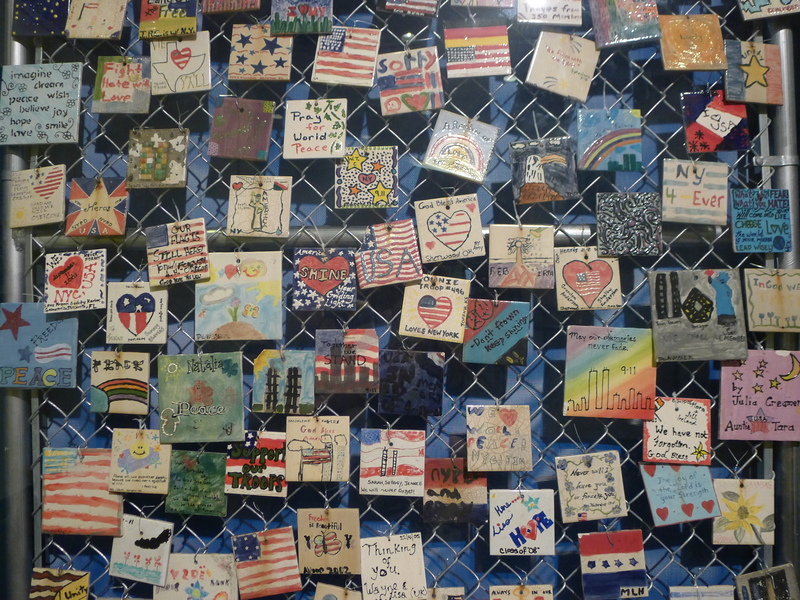 Meghan suggested I visit 9/11 Tiles for America, a series of hand-painted tiles – many by children – that were tied to a fence opposite St Vincent’s Hospital. 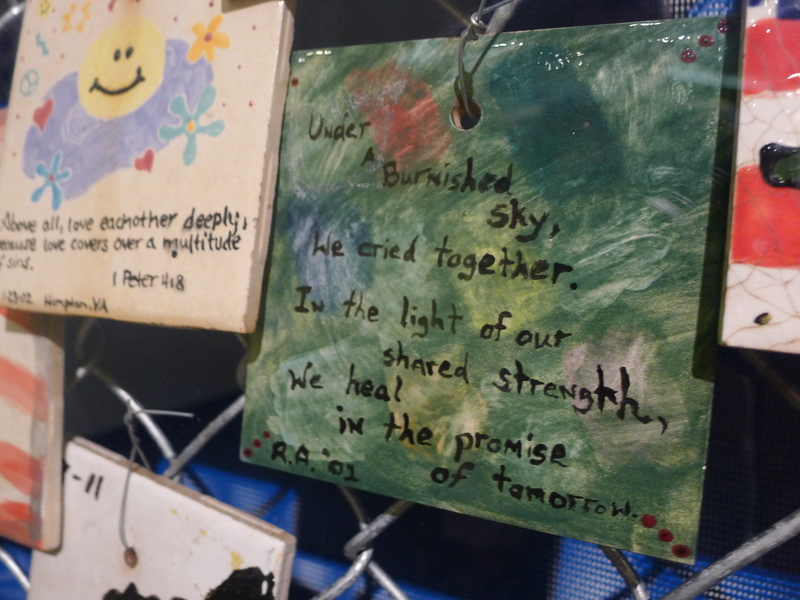 They initially acted as get well cards for the people who were recovering inside and later became a more general memorial for the city. 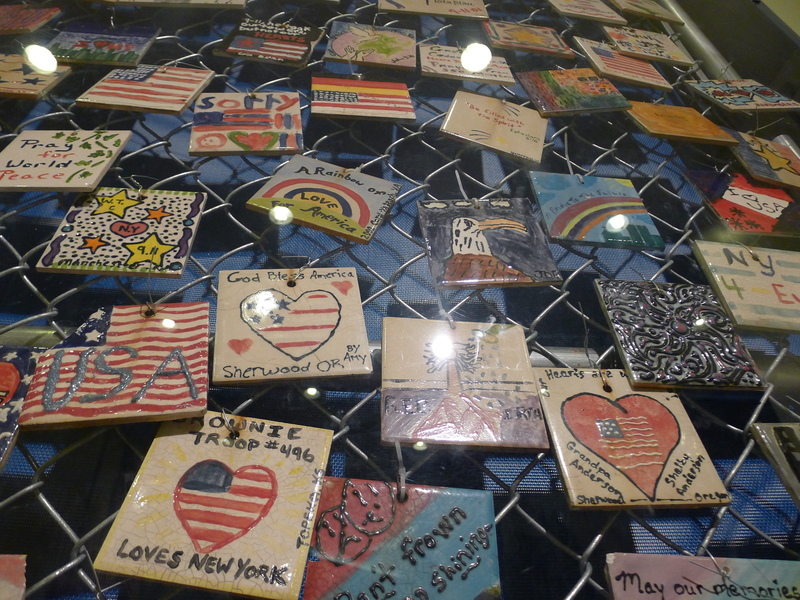 The tiles remained on the fence until 2011 and now some are stored at the Jefferson Market Library in the West Village. I thought it sounded a great idea. 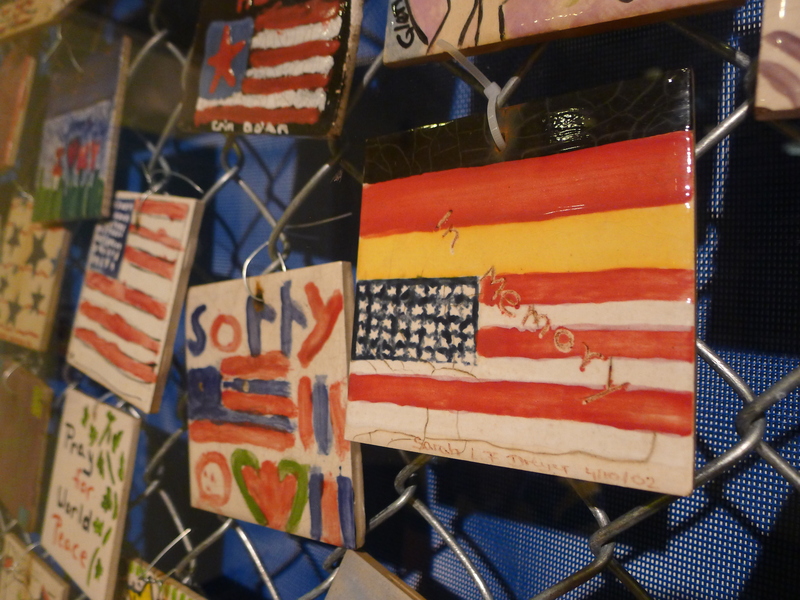 There are around 30 tiles in the entrance to the library – a stunning red-bricked building that once housed a Manhattan court. 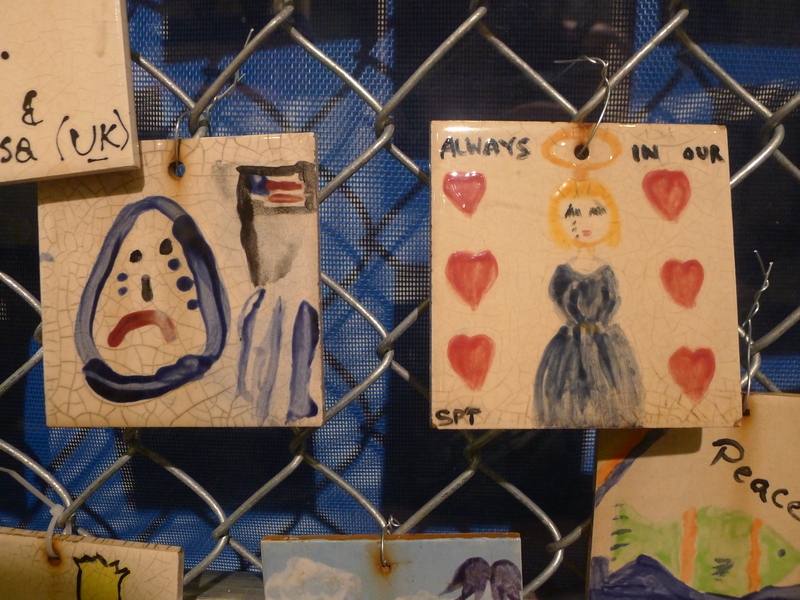 The small paintings show heartbreak and hope, American emblems and uplifting messages. 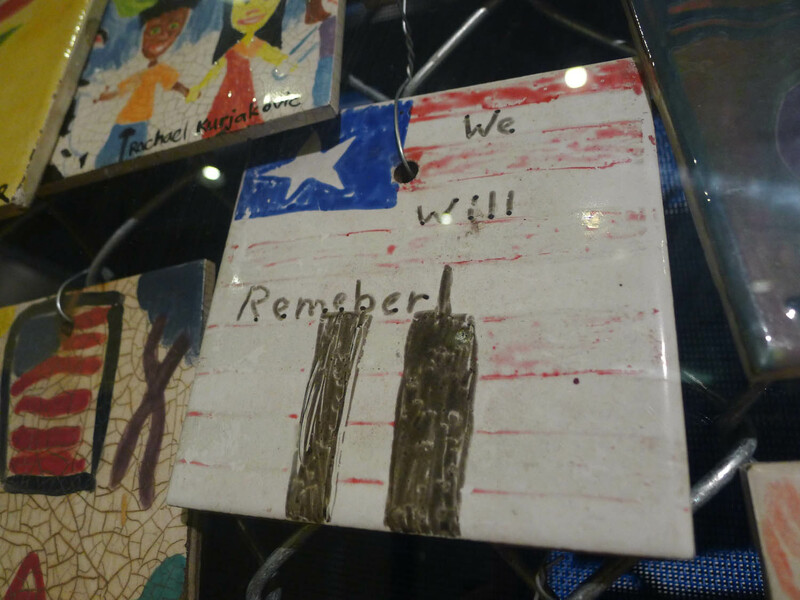 They show the innocence of children trying to understand the enormity of the event, but also just how much they did get it – some tiles simply showed tears rolling down painted faces. 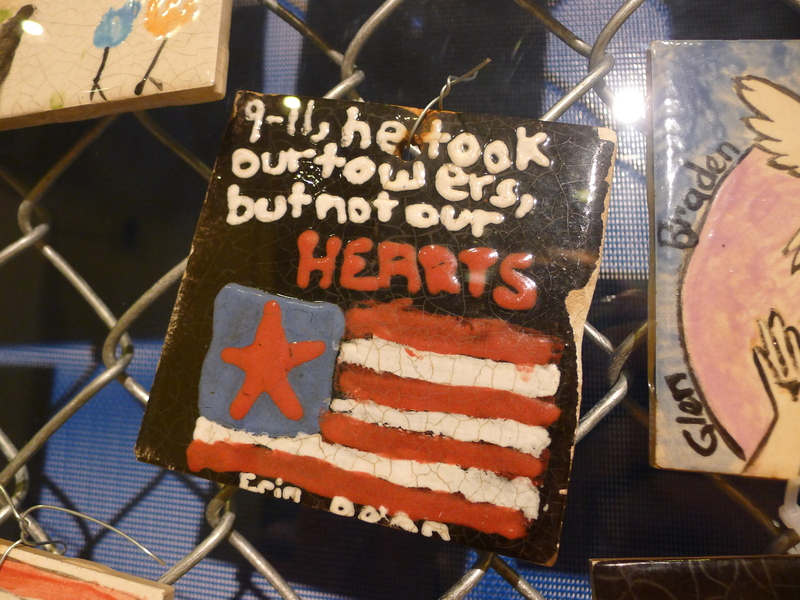 I sat there for a while, taking in every tile, wondering if these little painters had lost loved ones, what they were feeling and how they just wanted to show the victims they cared. It really got me. While I would never pretend to fully understand what New York suffered that day, I know I’ll continue to think about 9/11 all the time – it’s inescapable here. I’m really glad that I took a longer moment today to think of all of those people whose lives were cut short and the loved ones who still miss them every day. 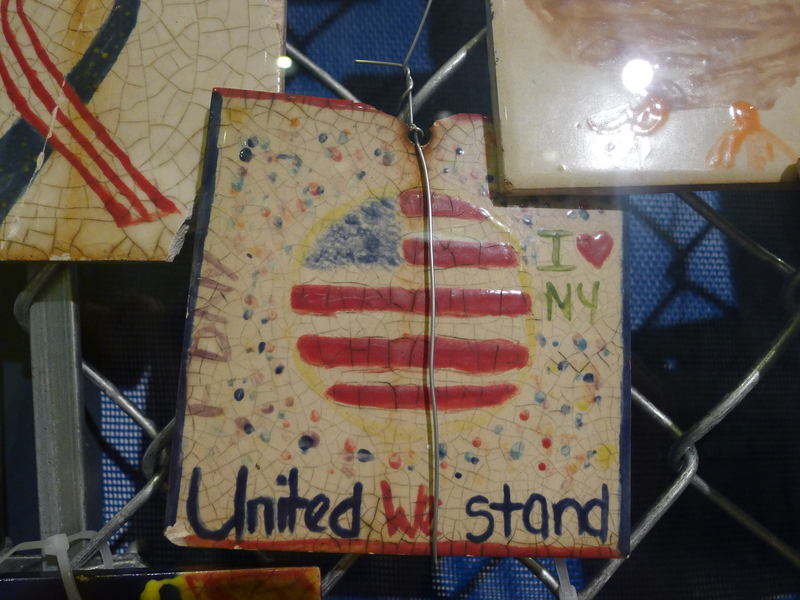 There is a small collection of the original tiles on Display at the AB Gallery in Tribecca 185 Church St along with the “Love Bench” which was added to the original site when the community gathered to rehang the tiles and pay tribute on the 10th anniversary of 9/11 after Village Angels saved them from hurricane Irene. 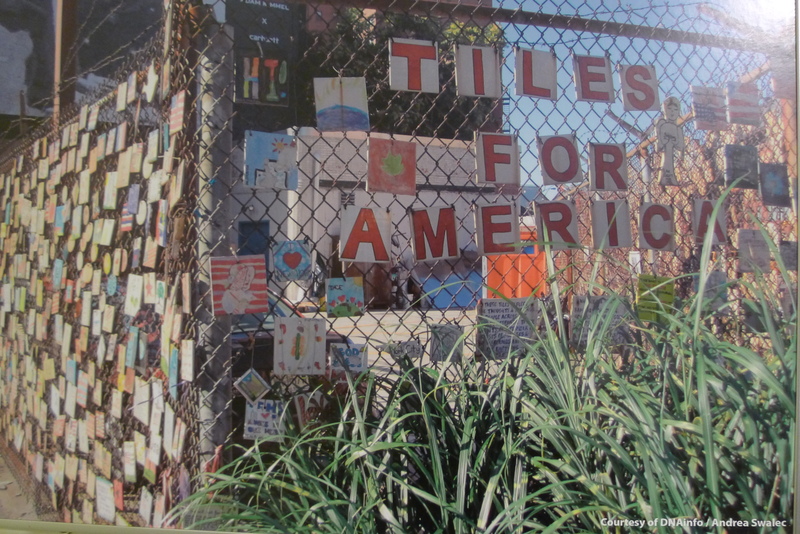 The Tiles for America Preservation Project has the tiles and is working very hard to get them into a permanent space near the original site. 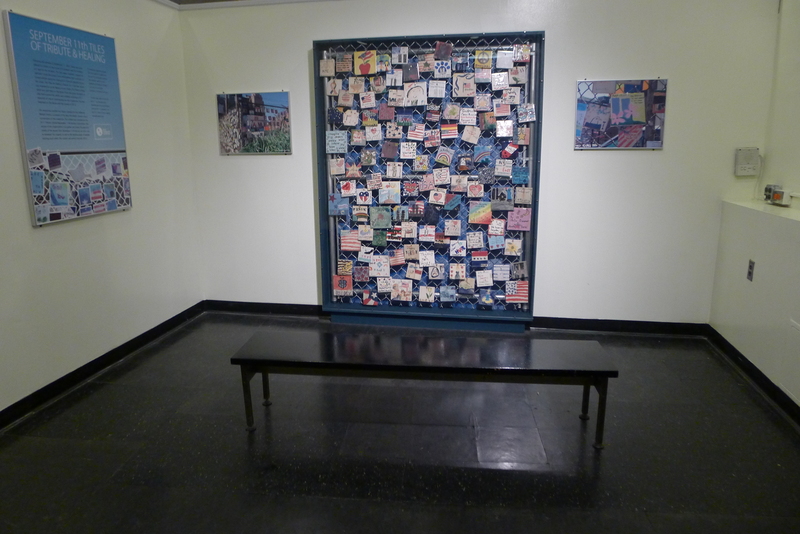 The tiles collection and the Love bench will be on display until October 31st and we will be starting to raise funds to create a “Global Community Center” shortly there after. 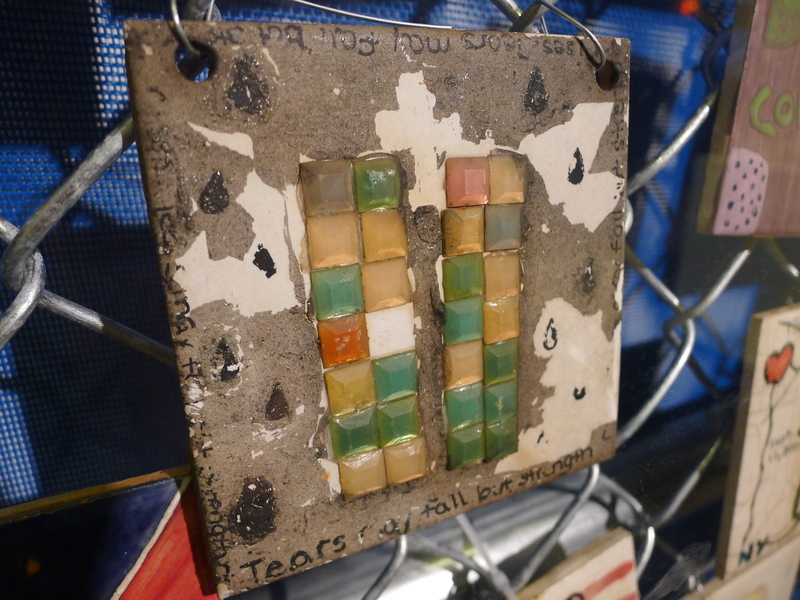 Thanks for remembering the memorial and sharing.